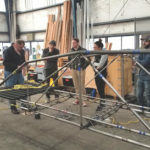 ASCE President-Elect Kristina Swallow with the University of Illinois steel bridge team. It’s starting to look like a student dynasty of sorts is forming north of the border. 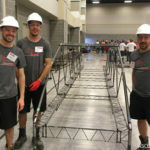 The École de technologie supérieure steel bridge team won its second consecutive national championship, May 26-27, at the 2017 National Student Steel Bridge Competition in Beaverton, OR. Add in the ÉTS 2016 national title in concrete canoe, and it’s quite an impressive run of success for the engineering students at the Montreal university. “Four years ago, when I started as a member on the steel bridge ÉTS team, we could not have believed that we could compete against the best universities of the United States,” Diotte said. “Remember that we are a small university, French Canadian from Quebec, where only the bachelor’s degree in engineering is taught. 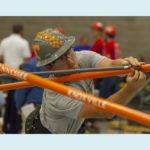 Forty-three student teams from schools across the world competed in the national steel bridge competition, hosted this year by the Oregon State University School of Civil and Construction Engineering and the OSU ASCE Student Chapter. 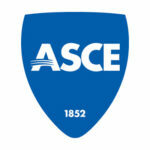 ASCE and the American Institute of Steel Construction again were cosponsors. ASCE President-Elect Kristina Swallow, P.E., ENV SP, F.ASCE, and her husband, David, P.E., M.ASCE, served as judges for the competition. Following ÉTS in first place were Lafayette (PA) College in second and California Polytechnic State University, San Luis Obispo in third. In a repeat of last year’s competition, ÉTS did not win any single category. Lafayette placed first in construction speed and economy. Cal Poly San Luis Obispo won category titles for lightness and efficiency. Tongji University, of Shanghai, China, earned top marks for stiffness, while Lakehead University, of Thunder Bay, Ontario, Canada, won for display. In the end, though, the balanced approach worked for ÉTS. Diotte graduates this summer, but she is confident the team’s legacy of success will continue. See complete final standings and read more about the national event.